Isle of Arran Distillers has given its core range of single malts a packaging makeover, inspired by the dramatic landscape and natural beauty of the place where the whisky is made. Pocket Rocket Creative has redesigned the packaging of four of the distillery’s key expressions to better reflect their quality and provenance. The colours on each of the new bottles have been chosen to mirror the hues of the landscape on the Isle of Arran where the whisky is made. Distillery MD Euan Mitchell says: “We feel very lucky to call such a beautiful place home. It offers us so many perfect conditions for making top quality whisky and as so many of our expressions are inspired by the legends and landscapes of Arran, it makes sense that the packaging does too. The Arran 10 year old malt, the distillery’s classic expression and flagship bottling, has been redesigned in shades of green, which reflect the mossy green of Arran’s hills. The Arran 12 year old, the only cask strength expression in the core range, now comes in shades of grey inspired by the rugged rocks and stones that adorn the island, while the 14 year old has shades of purple in an echo of the heather on Arran’s hills. The new look of the Lochranza Reserve, a non-aged single malt bottled at 43%, uses shades of blue inspired by the often dramatic skyline. Euan adds: “We’ve gone for a modern feel but kept some of the classic design cues, such as the copper edging, because these are our classic single malts which our loyal followers will recognise. 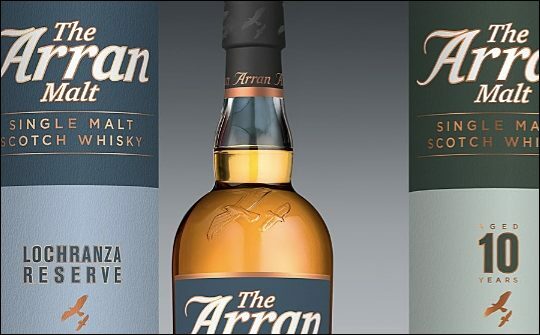 Each of the whiskies in the Arran range are non-chill filtered and made without the addition of any artificial colours. The distillery only ever uses ex-sherry and ex-bourbon casks to achieve the characteristic well-rounded flavour. Retailing at £32.99 to £44.99, the Arran core range is available from specialist whisky shops and from www.arranwhisky.com. The Lochranza Reserve should soon be available in supermarkets.